The Algoma Pierhead Lighthouse, also known as Algoma Light, is a red, steel structure overlooking Lake Michigan. It stands 42 feet tall and is accessible from Lake Street. The grounds are open to the public but the tower is closed. The city of Algoma, which means "park of flowers," was one of the lone surviving towns in the great Peshtigo Fire of 1871, which destroyed many towns in eastern Wisconsin and western Michigan...along with Chicago. Heavy rains saved Algoma, which used to be known as Ahnapee. 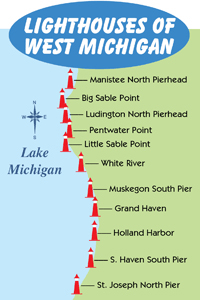 During this time, the fishing fleet was one of the biggest on Lake Michigan, forcing the need for a decent harbor. So in 1875, plans to create a harbor at Algoma were begun, but the depth at the mouth of the Ahnapee River was only three feet which limited commercial use. Finally in 1907, a pier and breakwater were constructed, along with a harbor large enough for commercial vessels. 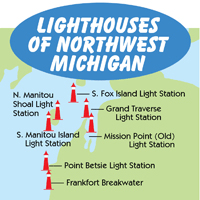 A light was already in Algoma, but the Lighthouse Board felt that a more permanent structure should be constructed. With $2,500, a timber pierhead tower and post light were finally put in place and became operational in 1893. The tower was 16 feet square at the base and was 35 feet from base to ventilator ball. 400 feet of elevated walk was installed on the pier in 1897, making for safer passage during high seas. Later in 1900, 338 feet of additional walkway was added. Sensing the need for the keeper to live at the structure, $3,500 was given to construct a keeper's quarters at the Algoma Light. In 1909, a six-room dwelling with red brick was built, followed by an electrically operated siren fog signal. Local residents became annoyed with the sound from the fog signal, so in 1923, keeper Carl Graan invented a curved device to go around the fog trumpet, which reflected most of the sound seaward. 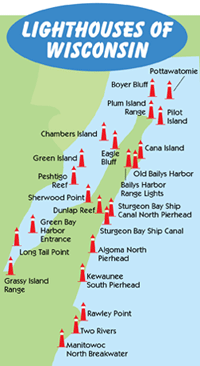 In 1932, the red, steel lighthouse that is in place today was relocated to Algoma, as well as capping the north and south piers with concrete. This was all part of a $100,000 harbor improvement project, and a new diaphone fog signal was added to the tower, which operated by remote control. Automation of the lighthouse took place in 1973. 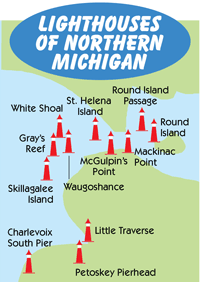 The Algoma Light has had just six keepers throughout its history. 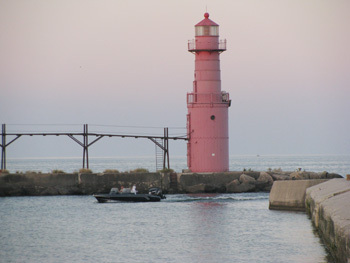 The Algoma Pierhead Lighthouse is just one of many beams of light that surround the waters of Lake Michigan, making maritime travel safe for everyone.